Girona is one of Catalonia’s biggest cities, located in North-eastern Spain less than 2 hours away from France. It lies at the heart of one of the most beautiful provinces in Spain. The beaches and coastline of the nearby Costa Brava are reminiscent of California’s Big Sur, with many charming coves and pine forests. The best hotels in Spain are also located in the Girona (“Gerona” in Spanish) province, many historic castles and villas, which have been transformed into luxury hotels. Charming fishing ports, medieval villages and the dramatic scenery of the majestic Pyrenees Mountains are all major attractions. Girona itself is a fascinating city to visit. From its early Iberian inhabitants, the Romans seized control of Girona, calling it “Gerunde”. Later, as in most of Spain, the Visigoth kings came into control, before being knocked out of power by the Moorish Caliphs. Charlemagne himself took it back from the Moors in the 8th century and shortly after, it became part of the kingdom pertaining to the Counts of Catalonia. Barcelona was also a “countship” and is still called “La Ciudad Condal”. In the 12th century, a Jewish community flourished in Girona. Along with Toledo, Cordoba, Seville, Besalu, Barcelona, Tarazona and a few other villages and towns, Girona was a very important city in Sephardic Spain. In the 1100’s Girona was home to one of the biggest Cabalistic schools in all of Europe. Sadly, in 1492, the year Columbus arrived at the Americas and changed Spain’s future forever, all of the Jews who refused to convert were expelled from Spain, thus ending a period of tolerance that the Jews, Moors, and Christians had previously enjoyed. The Jewish Ghetto in Girona is today, amazingly, one of the best preserved in Europe. As in Barcelona, the Jewish quarter (called “Juderia” in Spanish) is named the “Call”. It’s a lovely neighborhood of narrow cobblestoned alleyways, flower-covered balconies, and ancient houses and shops. These days, Girona is a bustling, little-visited city. The Onyar River cuts through the city and pretty pastel colored villa-style buildings line the river on both sides. Full of fashionable shops and elegant restaurants, not to mention superb historic hotels in the region, it’s a delight to visit and not as packed with tourists as other Spanish cities. Girona is full of beautiful reminders of its past- from the Jewish “Call” to the Moorish baths, to the abundant medieval architecture and more recent “Modernista” architecture. 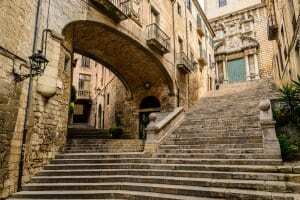 Girona used to be completely surrounded by a fortress wall, and a part of the remaining parts of the eastern city walls have been rebuilt, called the “Passeig de la Muralla”, which is now a lovely walkway around the ancient city, the “Casc Antic”. Girona is definitely worth a visit if you will be visiting Catalonia and is also a good base to visit many nearby attractions. The river setting is quite magical and a romantic place to stay overnight and see the city illuminated by night. Foie gras and truffles are two unique gourmet products from the Girona region and the local restaurants serve superb cuisine. Girona is also referred to as “The Orchard of Spain” and grows a huge quantity of high quality and organic apples, asparagus, artichokes, peas and artichokes for domestic consumption. 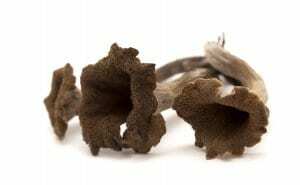 In the Pyrenees Mountains, a mind-boggling number of wild mushrooms are collected and Girona is known for its “Setas” and “Champiñones” from Chantarelles, Boletus, Tromppets de Mort (The Trumpet of Death), and Moixerons (some of the best, very intensely flavored). Seafood in Girona is an obvious asset with the coastline of the Mediterranean Sea and some of the most typical fish you will find on Girona restaurant menus include: “Rascassa” (Scorpionfish), “Lubina” (Sea Bass), “Salmonete” (Red Mullet), and “Mero” (Grouper). Lobster is also ubiquitous on the menus and is often served with chocolate, one of Salvador Dali’s favorite recipes. Wine is also produced in Girona and the most famous appellation is “Emporda-Costa Brava”. Dry red and white wines, sweet red wines and sparkling wines are all made here. The principal grapes used include (White)- Garnacha Blanca, Macabeu, Moscatel, Xarel-lo, Chardonnay, (Red)- Garnacha Tinta, Ull de Llebre (Tempranillo), Cabernet Sauvignon, Merlot and Cariñena (Carignan). The most well-known wineries in this D.O. (Denominación de Origen) include the market leader “Castillo de Perelada” (in the gorgeous medieval village of Pereleda, this winery really does own a perfectly preserved castle), the funky and artsy “Celler Espelt” (most famous for their dessert wine “Airam Garnatxa de l’Emporda Dulce”) and Oliver Conti (whose red wine is considered to be one of the best in the region and who is also an interesting winery for their experimentation and innovation; they are making interesting wines with the Gewürztraminer grape). These amazingly preserved Moorish “Baños” date back to 1194. In the 15th century, they came into private ownership until 1617 when they became part of the Order of Capuchin nuns’ convent, which they used as a laundry room! Thankfully in 1929, Girona’s monumental Arab Baths became Spanish Patrimony and the reconstruction and repair of these ancient baths could begin. The Jewish quarter. The principal street with most historic importance is the “Força” and many tiny alleyways all lead to and away from this street. Characteristics of this quarter are the narrow streets (you can touch both walls on either side of you on some streets) and the beautiful facades of the ancient structures. One of the most important and curious archaeological museums in Spain. Located inside a 12th century Romanesque Benedictine Monastery, this museum houses a collection of sculptures dating from the 11th to 14th centuries and exquisite Romanesque Frescoes. A quirky, private museum dedicated to cinema. The owner, Tomás Mallol, has collected objects related to theatre and cinema for over 25 years and for “Cineastas” this museum is a must-see. The most beautiful gardens in the city, actually considered to be a national treasure. The bullring is even inside these enormous gardens (over 40 hectares) and this “Parque” is an emblematic symbol of Girona. Located in the city of Figueres, the “Museu Teatre Dal” is in one word, amazing! If you are an art lover, do not miss this museum, as it is quite simply one of the best in Spain. The museum itself is a work of art and inside, you will find the largest collection of paintings, drawings and multi-media works of art that Salvador Dali created. A fascinating visit, and only 30 minutes from Girona. The most beautiful village in the entire Mediterranean coast, in our view, Cadaques is a gem of a place. While quite touristy in summer, the best time to visit is spring or fall, when the weather is excellent and the village empty of tourists except for a few French visitors who cross the border to come for lunch there. Whitewashed houses line the pretty coves and the seafront is full of cute restaurants where you can enjoy fish that has been fished that same morning! Olive wood products can be found easily here. The most beautiful medieval villages in the region include Besalu (with its Romanesque bridge and Jewish heritage), Peratallada (Gourmet mecca for its local cuisine) and Pals (quite close to the coast). Pals is really a hamlet more than a village but is boasts a cluster of gourmet restaurants and one truly special hotel, “Mas Salvi”, a gorgeous small luxury hotel, one of our favorite in Catalonia. There are many villages on the Costa Brava worth a visit, either for the village itself or the dining. Palafrugell, Palamos and Calella de Mar are all quite pretty. A visit to Carmen Ruscadella’s restaurant “Sant Pau”, in Sant Pol de Mar (closer to Barcelona) is a gourmet must.